and to all my friends and my family for their continued and life-time support. I would also like to take this opportunity to thank Edita Kaye, the founder of the Association of Virtual Worlds, for running the largest, the most popular and the most successful association in our industry. The Whole Web Has Become Social, How About Your Own Website? How About Your Own Website? Are the logos of Facebook and Twitter (and more recently Google’s +1 button) familiar to you as seen on almost any home page? How about links to the blog? Or other community and social initiatives? Everybody wants their company or website to be “social” these days. But adding a Facebook button on your homepage will not make your web strategy more social. It shows you understand the need for creating a community with a rich level of engagement and interaction with your customers and partners, but have you been able to truly measure the results? What if your visitors could actually engage and communicate with you ON your own website? What if instead of sending your traffic to Facebook, you actually took your own visitors to the next level of interaction? or to the next step in your sales process? This is exactly what you can do with an Avatar-based 3D website. You transform anonymous visitors into qualified prospects. Don’t let your web visitors walk away from your website. Engage with them in 3D to do more business. Let them walk into your virtual office to instantly engage so you can communicate with your website visitors. Within a fully customized 3D Online virtual space with avatars the immersive experience provides a humanized and entertaining first impression that will improve communication channels and increase conversion rates. A link to the 3D space is placed directly on your website and is accessible to all your visitors and is a great way to establish real relationships with your customers! Interact with your visitors and talk to them live in an immersive space (VoIP). Embed hyperlinks, taking visitors to purchase pages, contact pages, etc. No software to install, multi-platform, multi-browser, all hosted by Altadyn, included. Avatars are not just for Hollywood any more! Until June 24, 2011, subscribers to one year 3DXplorer/Meet-in-3D and get free customization. (total costs $990 instead of $1990). That’s 50% off. So hurry up. Stand out of the crowd and go 3D. 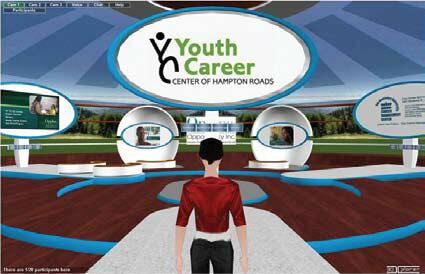 On Feb. 14, the Youth Career Center of Hampton Roads unveiled the Virtual Youth Career Center (VYCC), a three-dimensional, avatar-based virtual location accessible to youth via the Internet. Built on the 3DXplorer platform, The new virtual center allows youth to interact with peer mentors and YCCHR outreach assistants to explore career options, plan educational endeavors and prepare themselves for employment. Valentine’s Day was extra sweet this year for Opportunity Inc. as the workforce development organization introduced its newest venture to assist area youth: the Virtual Youth Career Center. The new center allows youth to interact with peer mentors and Youth Career Center outreach assistants from any computer where there is Internet access. The VYCC was developed in collaboration with Old Dominion University and will be jointly managed. Student peer mentors from ODU along with AmeriCorps volunteers from the Youth Career Center will hold virtual “walk-in” hours in the virtual world. They will use avatars to help youth explore career fields and prepare for the job search. The system allows for communication via two-way audio and chat. The Virtual Youth Career Center allows youth to access career-related assistance in a venue that is common to the technologically savvy youth today and is in itself a career immersion activity. “The Virtual Youth Career Center is another avenue to continue our mission to entice students to delve into career fields of the future in the disciplines of Science, Technology, Engineering and Math (STEM),” says Andrea Harrell, director of youth initiatives for Opportunity Inc.
Phase2Solutions Increases Revenue Thanks To 3DXplorer Products! Experts in Central PA have their own website: CentralPAExperts.com . It was created to provide local business professionals with a resource and online community to assist in the advancement of commerce in the Central Pennsylvania region. This website serves as an interactive resource for local professionals to get answers to their questions, an opportunity to read expert articles that are pertinent to their professional life and an opportunity for them to share their expert knowledge and meet others within their business community. 3DXplorer Meet-in-3D (3DX/Mi3D) : NEW 3D Virtual Office featured added to 3D Expert Lounge on website allowing each expert to have their own virtual space for private business meetings, sales presentations, etc. 3DXplorer Virtual Events Platform: Expert Virtual Events feature added allowing Expert Members to host virtual events in our 3D Conference Hall. Events are designed to attract new clients and providing valuable information to visitors at the same time. Enter Jason’s Networking Hall, or attend one of their conferences here. Watch A Recorded Video of CloudSlam10, The Global Virtual Event on Cloud Computing. CloudSlam™ C – Level Lounge™: An exclusive virtual space reserved for V.I.P delegates that have been selected to attend this gathering. The recorded video below shows how visitors discovered the virtual venues built in 3DXplorer, communicated with the exhibitors and netwroked with each other, in a unique immersive and engaging environment while easily accessible. Our Quick User Guide is now available for download. This PDF document is designed to help attendees and presenters get quickly up to speed navigating through virtual meetings and conferences authored with 3DXplorer v5. Avatar Guide: This section covers creating and customizing an avatar. Meeting Attendee & Visitor Guide: This section covers basic navigation and chat. Presenter Guide: This section includes presentation techniques such as sharing the desktop with attendees and delivering power-point presentations or demonstrations. The User Guide also contains troubleshooting tips. This handy resource ensures that both presenters and attendees will participate in successful and productive virtual meetings.